Rubbing to edges and corners bumped. Spine and covers creased. Book belongs to box filled in. Stain on fep and inside cover. 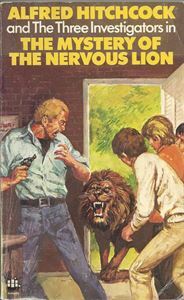 Their mission for Mr Hitchcock - to discover what has frightened Jungle Land's lion. But when Jupe, Pete and Bob see the huge cat advancing purposefully towards them, it doesn't appear to be nervous at all!